A few days before Christmas last year, my wife and I; and my sister and her husband drove to Bucyrus, Ohio, to visit our last surviving aunt. She is 94 years old (born on New Year's Day, 1925). She still lives alone after the death of my uncle (my mother's youngest brother) more than twenty years ago. Ironically, she's in better health than I am, (born in 1945). I wish she was a blood relative so that I might have access to the so-called "longevity genes," she obviously possesses (her parents both lived approximately one-hundred years). It is, of course, no secret than women usually live longer than men. 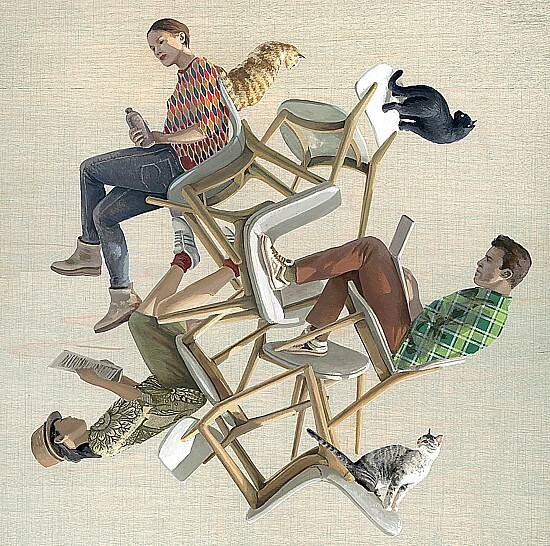 Actuarial tables confirm that on an average, women outlive men by about three to five years (depending upon a number of very complex factors). According to the charts, I should live to be about 78. My aunt has a very good chance of reaching the century mark. 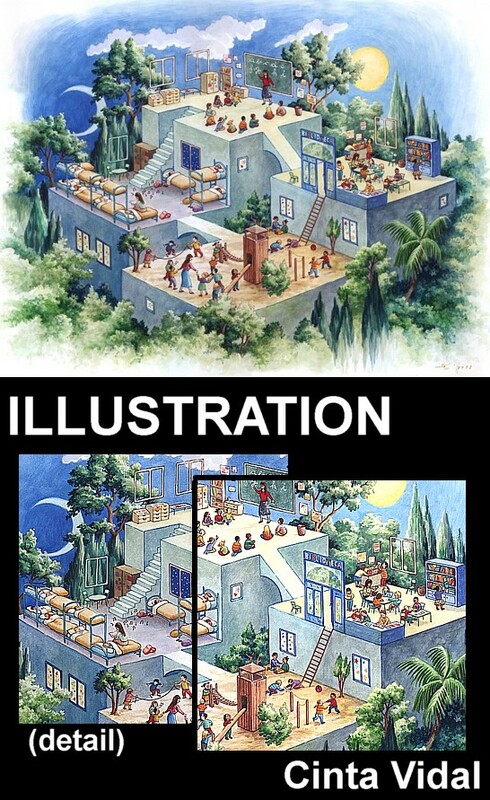 That's also the case with the Venezuelan-born painter, Luchita Hurtado She is currently 98. Luchita then (1920s), and now. However, it’s Hurtado’s work, rather than her rich story, that deserves attention—though in some ways, they are inseparable. During the nearly 100 years she has been painting, her work has been largely overshadowed by the men she married — Chilean journalist Daniel de Solar, Austrian artist and theorist Wolfgang Paalen, and for more than 40 years U.S. painter Lee Mullican, a founder of the “Dynaton” group, an influential trio of artists known for their interest in the surreal, the abstract and the cosmic. Although her work has been exhibited sporadically since the 1950s, mostly in group shows, it’s only recently that the art world has taken deeper notice of Luchita's paintings. Just in the last two years she’s had two solo exhibitions, but before 2016 her last solo show was back in 1974. At 98, Luchita Hurtado has had enough adventures for three lifetimes. She traipsed around Southern Mexico in the 1940s in search of pre-Columbian archeology. 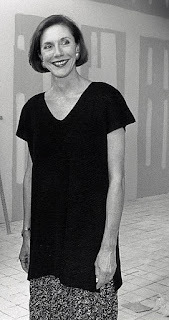 She was pals with sculptor Isamu Noguchi and Mexican modernist Rufino Tamayo. Marcel Duchamp once gave her a foot rub. Hurtado and her second husband moved to the San Francisco Bay are in 1948 following the death of her son from Polio. She needed to escape to a new environment. There, they were again surrounded by a community of artists—Giles and Sheila Healey, architect Sybil Moholy-Nagy, and poet Jimmy Broughton. It was there where Luchita met Lee Mullican, whom she would marry soon after she left Paalen. Some of Luchita Hurtado's more recent works--all "untitled," of course. Luchita Hurtado's "wall" at a recent group show, "Made in L.A."
Luchita's drawings’ are loosely Surrealist forms recalling dense pictographs from a variety of cultures, ancient and modern, A critic wrote in a review, “Hurtado’s work was multicultural before multicultural was cool.” Today, Hurtado and her feet are again big talk — this time for her striking paintings of feet and other parts of the female body against depictions of indigenous rugs, blue sky and sumptuous fruit. If Hurtado’s energy could be bottled as a tonic, it would no doubt sell out. Gallery owner, Paul Soto, who showed Hurtado’s work in 2016, notes, “She has this completely spiritual energy." One gallery guest contacted the museum to question the wall text that accompanies some of her paintings. They left a message saying they really loved the show but they found a typo. They thought Luchita’s birth date was wrong. "There’s no way, said the visitor, that a painter by the name of Luchita Hurtado could have possibly been born in 1920." 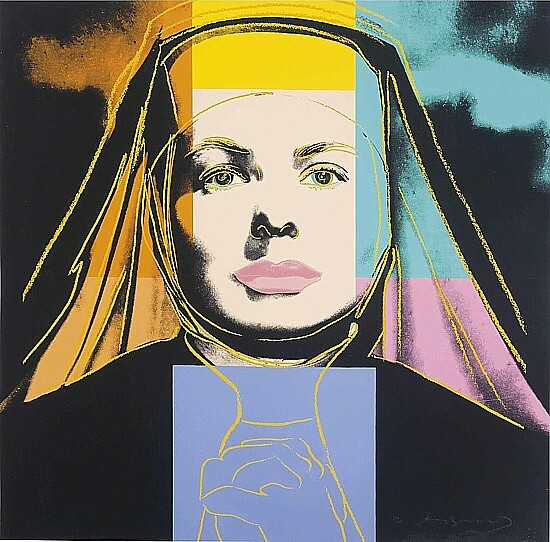 The Nun, 1983, Andy Warhol. Though neither Warhol nor movie actress, Ingrid Bergman (upon whom Warhol based his portrait) ever sought refuge in a monastic life, the "art thread" runs strong down through history in the lives of those who have. 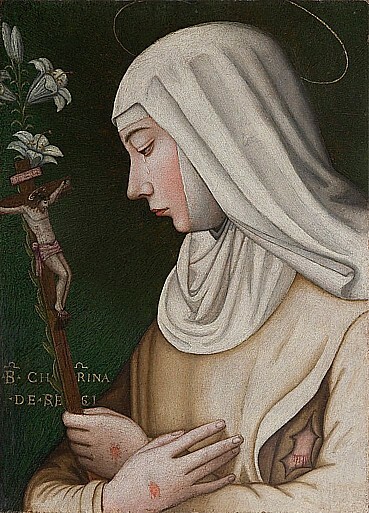 Saint Catherine of Bologna, ca. 1469. Just a little over three months ago the world of art lost one of the towering advocates of our time. 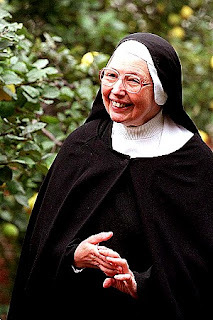 On December 26, 2018 (Boxing Day in England), Sister Wendy Beckett died at the Carmelite Monastery in Quidenham in Norfolk, England, where she had lived much of her latter years in a small, windowless, mobile home (caravan in English). Although her cause of death has not been officially disclosed, she apparently died of what has commonly come to be known as old age. She was 88. (A Sister Wendy video excerpt can be seen at the end.) It seems unlikely she ever picked brush and palette to create paintings on her own, but the history of art is replete with a surprising number of convent artists, both female and male who did. One of the earliest examples we know about (whose work survives) was Maria di Ormanno degli Albizzi, a 15th-century Italian nun, who au-daciously painted her own self-portrait. Forgoing the demure profile view that male artists cus-tomarily used in their depictions of refined quattrocento ladies, this miniature version of Maria stares out openly from the heart of a sumptuous gold and blue background. Yet this groundbreaking self-portrait was only intended to be seen by her Augustinian sisters; di Ormanno footnoted her likeness on the bottom of a page in a 490-page prayer book. 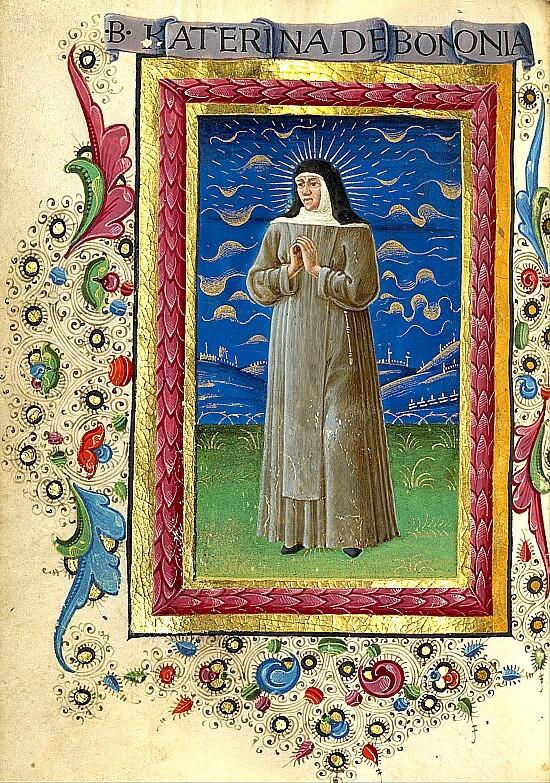 We may think of nuns as sequestered, But just as she was safely cloistered inside the walls of the Florentine San Gaggio convent, di Ormanno was able to paint her daring self-image precisely because it was safely nestled between the covers of her private prayer guide. For Renaissance nuns with a creative bent, convent life was not a problem—it was a creative solution. Many prospective nuns came from wealthy households and had some education; nunneries extracted women from the domestic responsibilities of marriage and motherhood, freeing them to further pursue their studies and even artistic careers. Sister Juana Beatriz de la Fuente, Arbol de la Vida, 1805. A century later, the prospect of courtship and marriage drove the early 1600s, Neapolitan painter Luisa Capomazza to find refuge in a convent. She rejected many advantageous marriage proposals, while nobly enjoying herself with painting. According to her biographer, the late-Baroque art historian and painter Bernardo de Domini, she was very much "in love" with painting. Luisa saw herself as quite constrained by the irksome pleadings of both suitors and their parents. Thus she decided to become a nun. 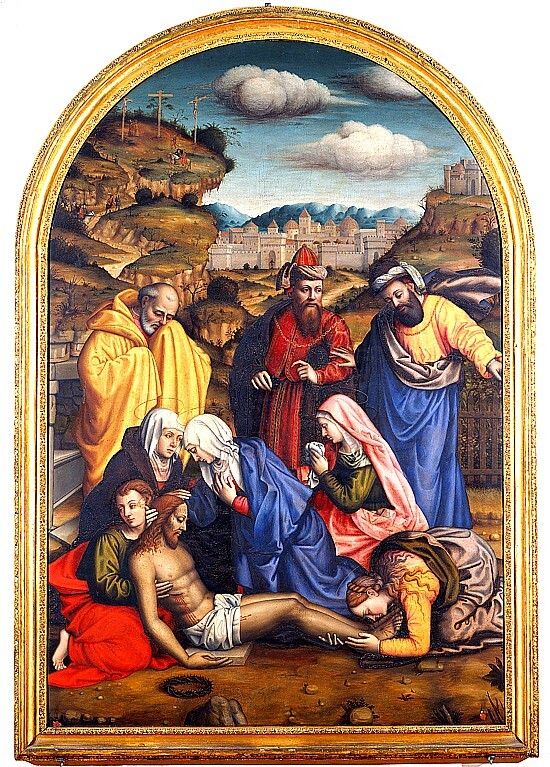 In the habit, Capomazza was free to paint a range of subjects, including altarpieces and landscapes. The latter genre was especially challenging for all women artists working in her time inasmuch as the direct study of nature was limited by rules of decorum, which dictated that women be chaperoned outside the home. Despite later having her own biographer, few if any of Capomazza's paintings can reliably be attributed. Saint Catherine with Lily. 1750. During the Renaissance, it was common practice for families to send women who weren’t in line to receive the hefty dowry reserved of eldest daughters off to convents. For a variety of economic reasons, not to mention the inclinations of women like Capomazza, convent populations exploded in Italy.. In 1515, there were 2,500 nuns in Florence alone, but by 1552, one out of every nineteen Florentines was a nun. The popularity of this lifestyle is not surprising, considering the socially repressive alternative. Generally speaking, convents have served as one of the most supportive artist residency programs available to women in the history of Western art. 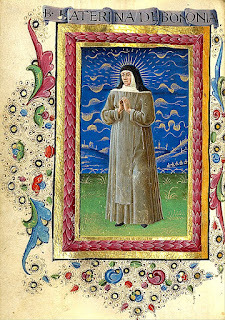 Sister Plautilla Nelli (above, right), for example, was probably enticed to join the Florentine convent of Santa Caterina of Siena because of its artistic reputation. 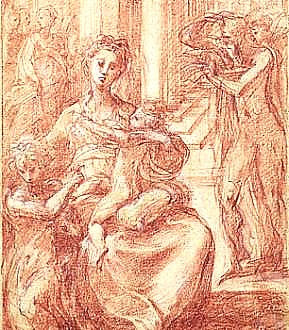 After entering the sisterhood in 1538 at age 14, Nelli gained access to the convent’s large collection of prints and drawings, some of which she may have traded with art historian Giorgio Vasari, who mentioned her in his second edition of Lives of the Most Eminent Painters, Sculptors, and Architects, (1550). Nelli learned to paint at the convent. Vasari relates, “She, [began] little by little to draw and to imitate in colors panels and paintings by excellent master. She has executed some works with such diligence, that she has caused artists to marvel.” Her works were in demand, and she soon headed her own workshop at Santa Caterina with as many as eight nun/artists studying and working under her. Though they proudly produced devotional paintings for private collectors, the nuns of Santa Caterina also created expensive, monumental artworks for themselves. Nelli’s workshop painted a large-scale Last Supper (ca. 1560) for the convent’s refectory is nearly equal in length to Leonardo da Vinci’s fresco on the same subject. It is currently undergoing extensive restoration and this October will be unveiled to the public for the first time in nearly 500 years. 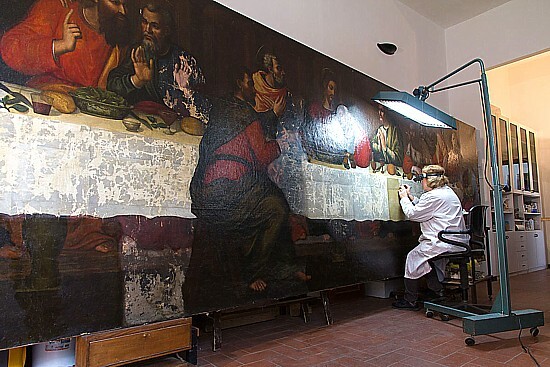 Conservation work for Sister Plautilla Nelli's, Last Supper, dating from around 1560. Leonardo discontinued his misbegotten efforts about 1498. Convents beyond Italy and long after the Renaissance continued to nurture women artists. Their stories are still slowly being patched together as religious works change hands. 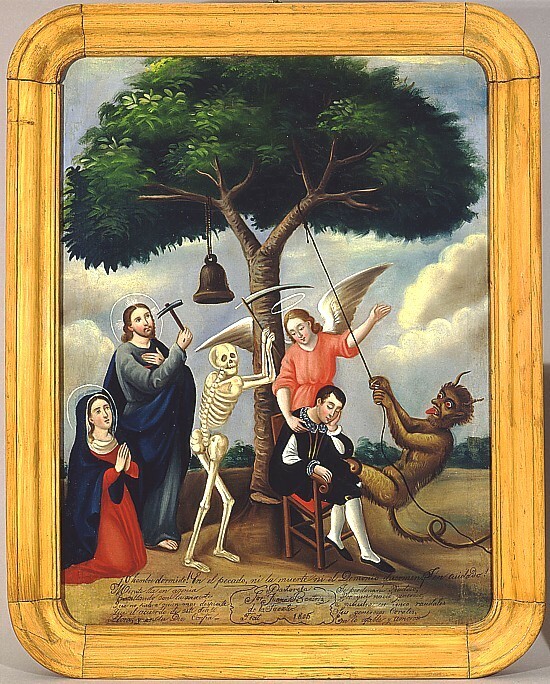 Decades ago, Marion Oettinger, curator of Latin American art at the San Antonio Museum of Art, spotted an unusual 19th-century painting for sale at a Latin American folk art gallery in California. He examined the signature and found that it was created by Juana Beatriz de la Fuente, a nun from colonial Mexico. This is still her only known work. 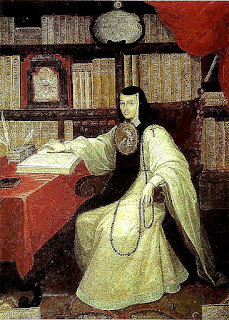 “We have no idea who she was,” Oettinger explains, though he imagines that her life resembled that of her more famous sister of the cloth, the 17th-century Mexican scholar, painter, and poet Juana Inés de la Cruz, (right) who had the luxury of a room of her own and materials provided for her. When I start writing about architects, it's tempting to land on one particularly outstanding example and sing the praises, or heap all the criticism on that one structure. 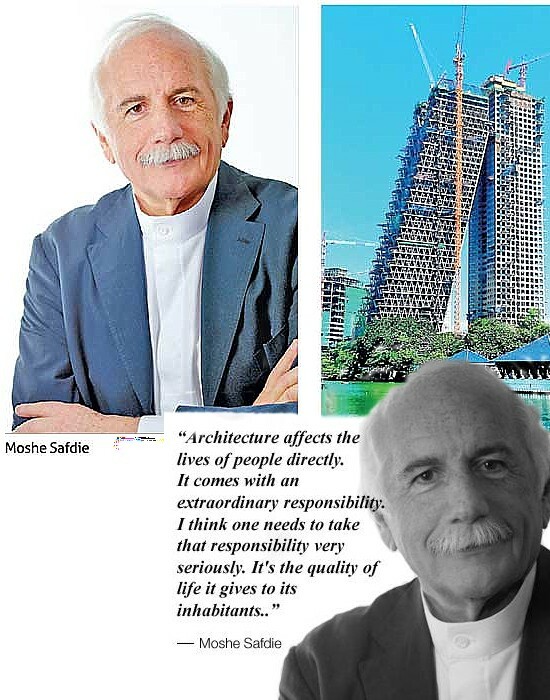 Never has that been more of a temptation than in discussing the long, incredible career of the Israeli-born architect, Moshe Safdie. It must have been something of a mixed blessing back in the mid-1960s...yes, more than fifty years ago...to have achieved international acclaim as a result of his first major commission--Montreal's Habitat '67. Not every ambitious young architect makes architectural history so early on. It must have been quite a challenge to choose an encore. It was, indeed. Having established his own firm in 1964, Safdie's projects for the next ten years hollowing Habitat '67 were limited to various modest structures in the blossoming state of Israel. Today, Safdie's frim has designed nearly forty structures around the world. 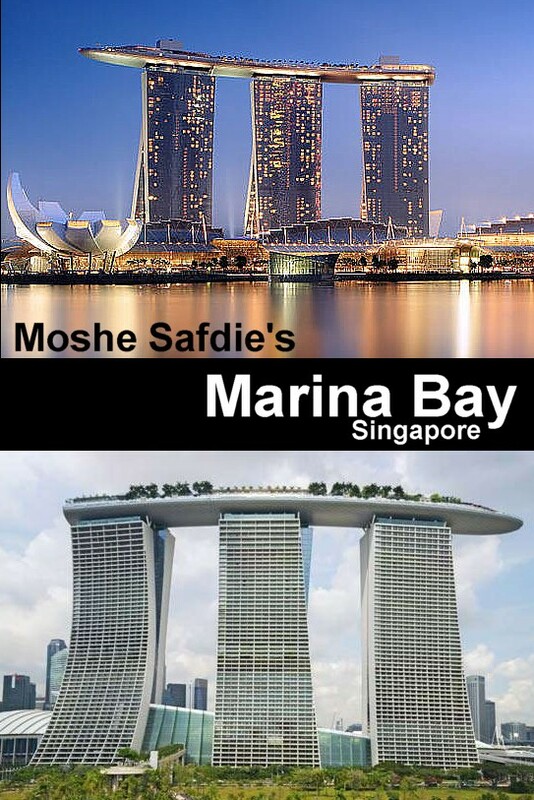 Moshe Safdie was born into a family of Jewish Syrians living in what was then Palestine in 1938 (now Haifa, Israel). After apprenticing with the famed Louis Kahn in Philadelphia, Safdie returned to Montreal to oversee the master plan for Expo 67. In 1964, he established his own firm to undertake Habitat 67, an adaptation of his McGill thesis. Habitat '67, which pioneered the design and implementation of three-dimensional, prefabricated units for living, was a central feature of Expo '67 and an important development in architectural history. Safdie was awarded the 1967 Construction Man of the Year Award from the Engineering News Record and the Massey Medal for Architecture in Canada for Habitat '67. Habitat '67--never before had so many room-size prefabricated blocks been joined on such a large scale. Habitat '67 (above) is widely considered an architectural landmark and one of the most recognizable and spectacular buildings in both Montreal and Canada. The development was financed by the Canadian government, but is now owned by its tenants, who formed a limited partnership that purchased the building from the Canada Mortgage and Housing Corporation in 1985. Safdie still owns a penthouse apartment in the building (four concrete cubes). Habitat 67's interlocking forms, connected walkways, and landscaped terraces were key in achieving Safdie's goal of a private and natural environment within the limits of a dense urban space. Habitat '67 comprises 354 identical, prefabricated concrete units arranged in various combinations, reaching up to 12 stories in height. Together these units create 146 residences of varying sizes and configurations, each formed from one to eight linked concrete units all held together by steel cables. The complex originally contained 158 apartments, but several apartments have since been joined to create larger units, reducing the total number. Each unit is connected to at least one private terrace, which can range from approximately (225 to more than 1,000 square feet (20 to 90 square meters) in size. Sky Habitat is one of Safdie's newest(2012) completed projects. What's it like to own some of Safdie's stacked concrete cubes? Well, first of all you'd best be "made of money." A three-cube unit of 2390 square feet recently listed for $1,375,000. Moreover that doesn't include a monthly "contribution" of $2,705 for taxes, utilities, a single indoor parking space, a private storage locker, 24-hour security, a tennis club with clay courts, an Instructor. and free shuttle bus tickets to beautiful downtown Montreal. 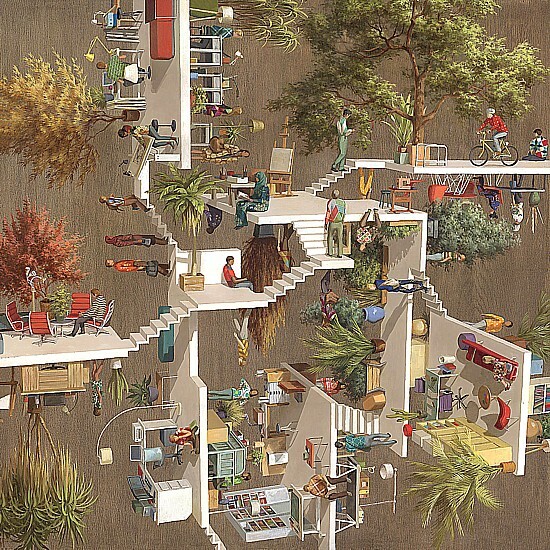 Life in Habitat '67, is unique in all the world. Located on an island in the middle of the St. Lawrence River, Habitat's piling up of cubes seems to deny the laws of gravity, with its garden terraces, its fountains, and its large estate. (Habitat '67 was declared heritage building by the Government of Quebec in 2009, and has been recently restored.) However, if you've a yen to move to Singapore, there Safdie has designed a 21st century version which he calls Sky Habitat (above). The units there might cost a little more, though. The Marina Bay Sands integrated resort, Singapore, designed by Moshe Safdie. Or, you might choose Marina Bay (above), yet another Moshe Safdie high-rise apartment complex also in Singapore. Completed 1n 2010, the group of six slab-like buildings seem to lean lovingly against one another. 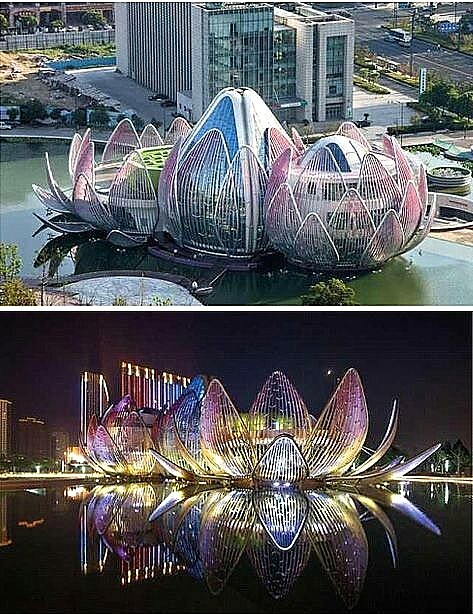 Marina Bay also comes complete with its own arts and sciences museum designed by Safdie (below) in the shape of a Lotus blossom. As lovely it is to look at during the day, nighttime renders Safdie's creation even more spectacular. A portion of Safdie's Marina Bay Sands can be seen in the background. Not to be outdone by the Malaysians, the Chinese can also claim a Moshe Safdie as their own. Located in Heibei Province (north-central China). 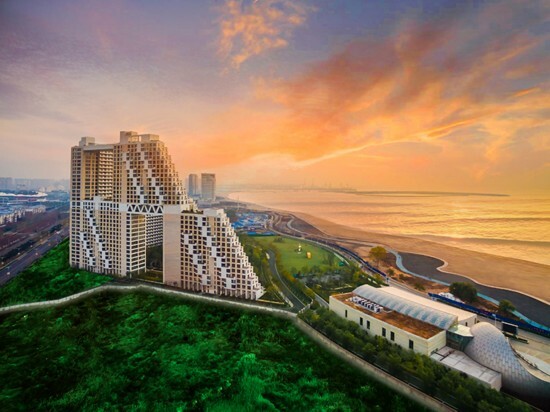 Safdie's Golden Dream project is set to become the crown jewel of that city's new Special Economic Zone (SEZ). Heibei is industrial China at its rawest: smog, relentless, incredible construction, and traffic stretching along hundreds of miles of expressways. While its attractions are obscured by its industrial output, the province has plenty of sightseeing, outdoor recreation, and skiing in a region where few international tourists venture. 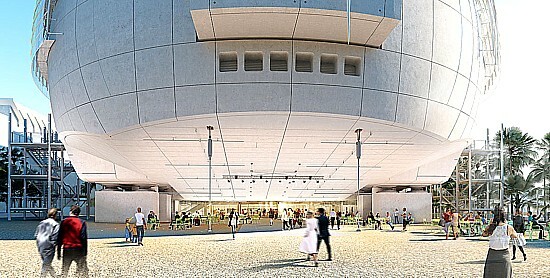 The builders of Safdie's Marina Bay hope to change all that. The Marble Collegiate Church can be seen on the right. And finally there's no reason one must trek to the Far East, or even Canada, to experience Safdie's revolutionary architecture. Officials of New York City's historic Marble Collegiate Church have recently unveiled plans for Safdie's first New York structure (above). Planned to rise on a Manhattan site at West 30th Street, between Broadway and 5th Avenue, the as-yet-unnamed 64-story mixed-use tower will feature a limestone base that compliments and serves its historic neighbor. 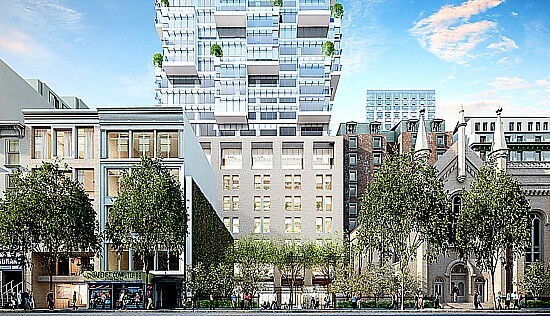 The building will be distinguished by its vertical massing, which breaks down the scale of the tower into a series of three-story-high, offset projections. The offset projections also provide energy efficiency by self-shading the tower’s façade, further enhanced by additional sun shading of the south façade. The tower will house new administrative and programming spaces for Marble Collegiate’s congregation, the administrative staff of the Churches, and Intersections International, a major conflict resolution initiative of the Collegiate Church. Funds generated by the building will support both the restoration of the historic church and the vital programs of the Collegiate Churches. 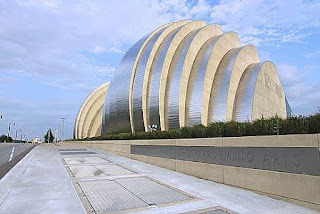 Safdie's Kauffman Center for the Performing Arts. During my twenty-six years teaching art in a public school I encountered dozens of students with exceptional talent. I once exhibited about fifteen paintings and drawings created by my students at a local club. Three of the fifteen sold for modest prices (less than $50 each). It used to irritate me a little that the buyers seemed to be taking advantage of my students in purchasing pieces at a fraction of my judgment as to their value. But, learning to price one's work is part of learning to be an artist. Having said that, if talent and astute pricing were all it took to be a successful artist, there would be at least twice as many professional artists working today. Those factors are important, but the key element in any artist's success is promotion. In effect, I was serving as the promotor of my students' work, and apparently not a very good one. If I had been any good at promoting, I'd have used this aptitude in the promotion of my own work. Most accomplished artist could say the same. 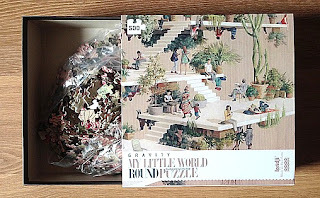 Los Angeles artist Skyler Grey is an accomplished artist, but beyond that he and his father have a knack for self-promotion that sees his work selling to buyers all over the world for prices ranging from $6,000 to $60,000. This from an artist who is only nineteen-years-old. 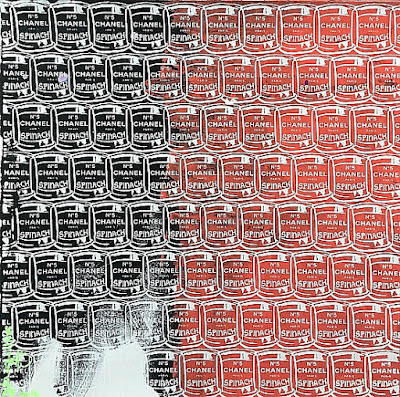 If one were to categorize Skyler's work it would be Pop Art inspired by the street art movement combined to create beautiful but offbeat works. 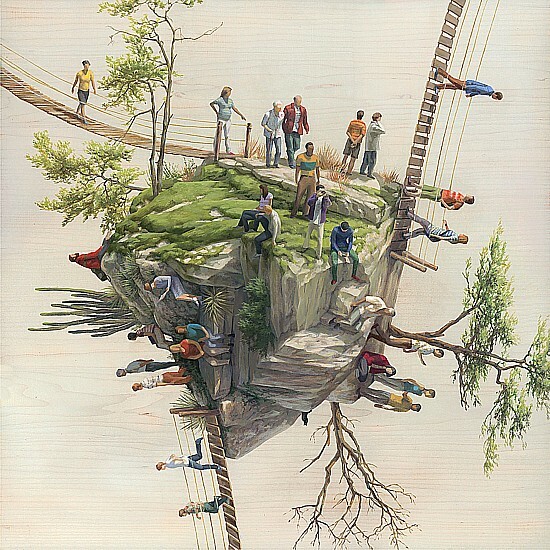 His work is colorful with some hints of darkness, and sprinkled with a few dashes of surrealism. Skyler prefers to think of his work as neither of the above but instead having a genre of its own. As the youngest artist ever to be internationally exhibited, at the age of sixteen, Skyler Grey is a rising star and one of the newest fixtures on the LA street art scene. After the tragic loss of his mother at age of two, he was subsequently placement in therapy that involved art and drawing. 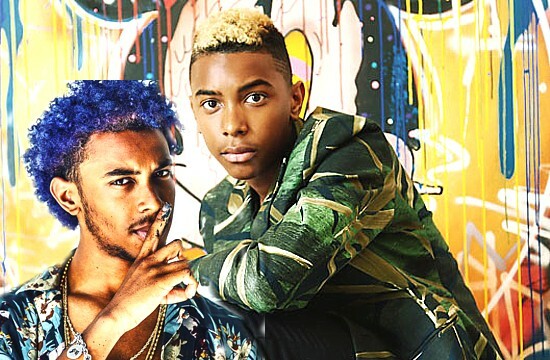 Grey’s father noticed his son’s incredible artistic interest, talent and creativity. Over the years, with his father’s encour-agement and continuous practice on various mediums, Grey has already transformed his talent into an ex-traordinary career. Although not formally trained, Skyler has educated himself by exposure to the arts and constant sharpening of his artistic skills. Influenced by artists like Jean-Michel Basquiat and Keith Haring, Grey has developed his own distinctive style and artistic concept. In addition to achieving early success as an artist, Grey has made strides in his community as well, being honored by Black Entertainment Television in 2014 at the 11th Annual 365 Black Awards which honors African Americans who have made positive contributions in the community. Two of Grey's versions of Queen Amy. Grey has been called "The Fresh Prince of Street Art." He began painting when he was ten years old, and had his first commissioned work at the age of thirteen. 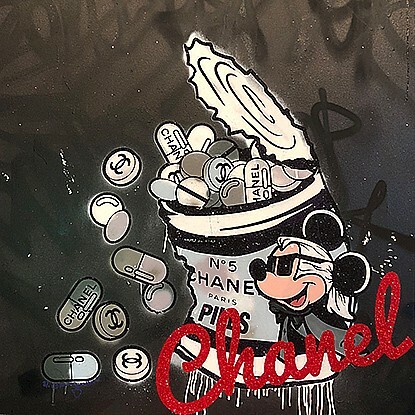 Rearranging pop cultural icons with bursts of vivid color, Grey’s works have been acquired by Hip-Hop artist The Game and pop singer Ashlee Simpson. One of Grey’s earliest and most widely-circulated works. 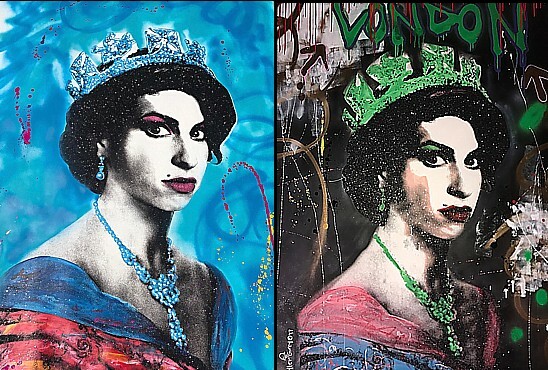 Queen Amy (above, appropriating late singer Amy Winehouse as the Queen Elizabeth II), has appeared in galleries and private viewings worldwide (there are several different versions). His work has been exhibited at venues in London, Vancouver, Miami, Los Angeles, and Dubai. He was featured in the 2017 edition of Forbes Magazine’s 30 Under 30 Art and Style. Like most teenagers, Skyler Grey goes through the usual morning routine of waking up, checking his phone, watching TV and grabbing breakfast. But unlike most high school grads his age who are now hitting the books in college, Grey heads to his home studio in Los Angeles each day, flips on his favorite music and starts painting. His studio is always happy, always nice, and always creative with nothing sad, mad, or having weird vibes. Grey claims that’s the only way you can make wonderful artwork. 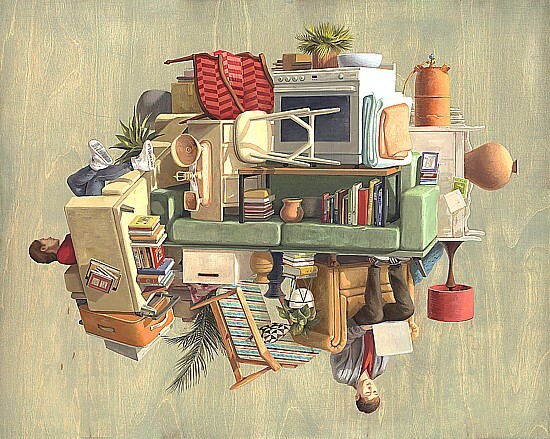 His mixed-medium paintings are a blend of bold colors, 3-D textures and street art techniques. The paintings’ overlapping layers of colors and patterns reveal new discoveries the longer they are studied. 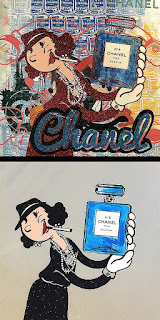 At the center of Grey's work are images of famous pop culture icons such as Popeye and Mickey Mouse, as well as high-fashion logos like that of Chanel and Louis Vuitton. Grey notes, “These are things that bring you back to happy times. I like to make people happy when they look at my artwork." In 2013, Grey hosted his first solo art show and received his first commission from a street art collector in Switzerland. The only instructions to the budding artist were, “Just make sure I like it.” Grey studied the collector’s Instagram account and discovered he owned a tattoo and piercing parlor and was a huge fan of Disney. The end result shows the familiar Mickey Mouse with psychedelic eyes, round ear gauges and a chest tattoo. Grey said the collector was blown away. 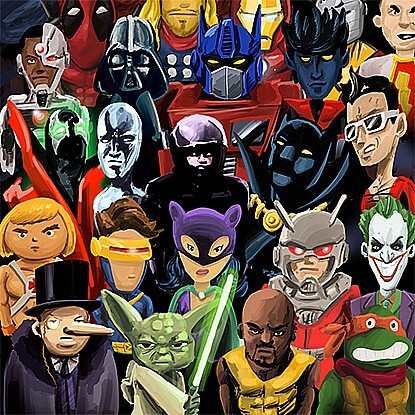 More recently, the artist’s popularity has skyrocketed. His art is in high demand among top musicians like Snoop Dogg, Alicia Keys, Sean "Diddly" Comb, and William L. Mack, Chairman of the Board, Guggenheim Museum. 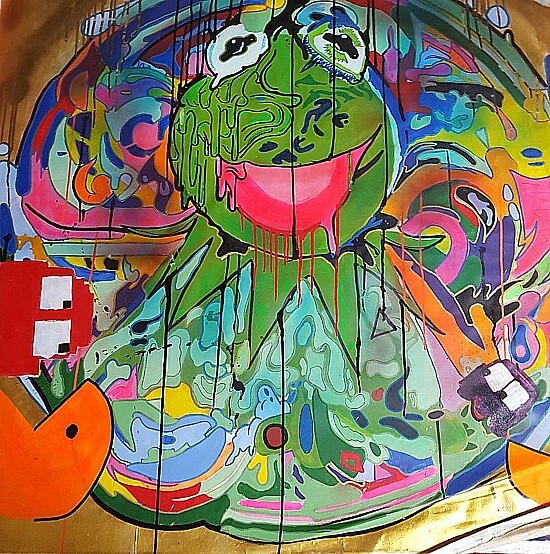 His paintings currently hang in Miami’s Avant Gallery, and his work has appeared in London’s Graffik Gallery as well as the Four Seasons Jumeirah in Dubai. 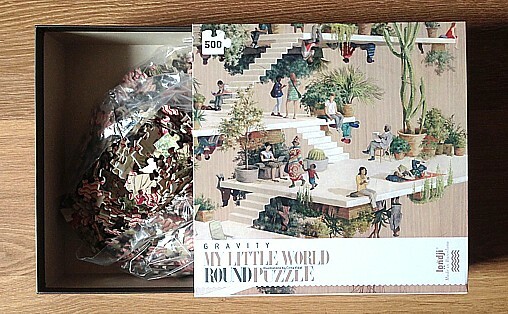 Free from the daily routine of high school classes, tests and homework, Grey can now fully immerse himself in his art. He typically works on multiple canvasses at a time, carefully crafting each vibrant layer. His materials include spray paint, acrylics, house paint and, most recently, diamond dust for a bit of bling. Grey says it takes him roughly three to four weeks to complete a piece. There’s a lot of things that set Skyler Grey apart from other artists. Mostly he has a look all his own. Every time he rolls out a new painting, you know it's going to be fresh. In 2018, Grey released a high-end line of jewelry art pieces in partnership with Jason of Beverly Hills. He also has plans for a musical album and would love to someday dabble in the acting world. In the meantime, his artistic talents continue to garner exposure within the art world’s most prominent spaces, such as the 2017 edition of Scope Basel with Avant Gallery and the sacred Wynwood Walls in Miami. Grey is an artist, but Skyler Grey is actually a brand. It's a brand likely to have incredible potential and staying power Today and Tomorrow (above). This, is an art museum? Yes, and one of the better expansion decisions to be found. It is the New Orleans Museum of Art's new Sydney and Walda Besthoff Sculpture Garden. Have you ever visited an art museum that was too small? Whether you realize it or not, if you've ever visited such an institution at all, then it was likely too small. Virtually no art museum on this planet has space to exhibit everything it owns. In some cases, such as the MET in New York, despite its immense size, displays only about 10-20% of its holdings at any one time. Thus, whether they like it or not, the MET and other such glorified art warehouses find themselves rotating their stock (or loaning it or building branches for it elsewhere on the globe). Of course, the obvious "solution" to this overstock problem is to expand, as the Met has done so many times the original building is now lost in a maze of new additions added down through the years. Artist, Linda Pace's Artpace, Southtown, San Antonio, Texas, 2014--and art museum much in need of a new, larger home (more on this later). Art Museums should grow, if for no other reason than to fulfill the old adage, "more is better." Old adages aside, as I see it, there are two major problems in this practice of forever expanding the floorspace to try and accommodate more...and more...and more. First of all, more is NOT necessarily better. I started by asking if you'd ever visited an art museum that was too small. Now, let me ask, have you ever visited one that was too BIG? With some notable exceptions, the answer to that would likely be "yes" as well. Just ask your feet at the end of your visit. When is an art museum TOO big? When it becomes overwhelming; when you can't see (or even find) all you came to see in one long, tiring day; or when your eyes glaze over from seeing too much of a good thing. I could spend the rest of this posting just listing museum around the world that have this expansion problem. The second pitfall in this rush to grow, grow, grow, is one of aesthetics. 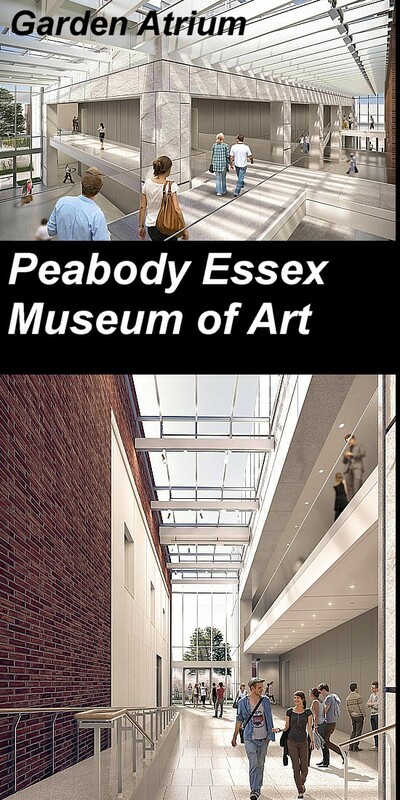 To illustrate this point, let me start with the Peabody Essex Museum of Art in Salem, Massachusetts. 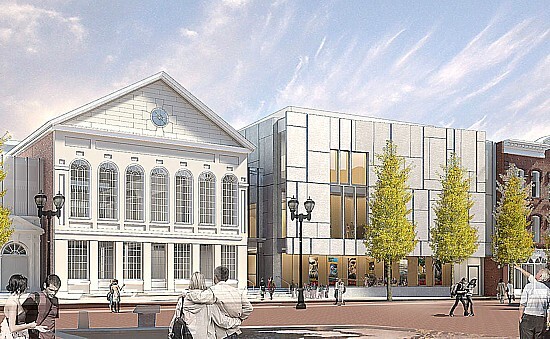 The Peabody Essex Museum's expansion rendering. See the problem? The Peabody Essex justifiably needed to expand. It was certainly in no danger of becoming too big. 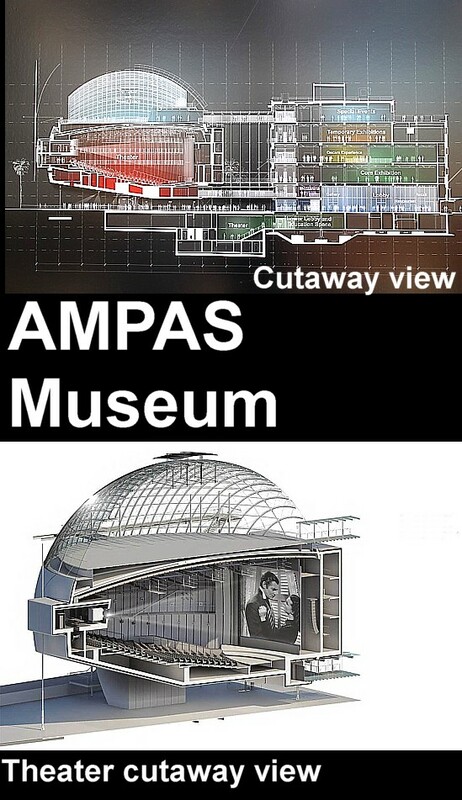 The problem faced by the expansion architects of Ennead, a nationally known New York architectural firm, was the contrasting styles of their plans and that of the existing structure (above). It's a persistent problem faced by a great many such expansions. Some try to accommodate the new in an old-style skin. 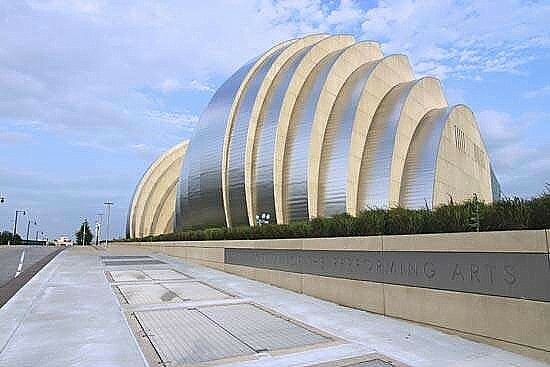 It's a noble thought, but one that goes against the innovative impulses of most museum architects, and in fact, it's seldom very successful in that regard. The alternative is to simply tack on the new to the old and let the chips fall where they may...as with the Peabody Essex expansion. Founded in 1799 by visionary New England entrepreneurs the museum holds a wondrous collection of art from people and cultures around the world. Succeeding generations of New Englanders have continued these efforts. Today PEM’s collections exceed 1.8 million works spanning more than 12,000 years of human creativity. The recently opened expansion is but one of four exciting new projects to share these extraordinary collections, many of which are among the finest of their kind. The PEM expansion is a beautiful, contemporary style addition that fortunately avoids yet another expansion pitfall--a building that competes for attention with the art it holds. The PEM's newly constructed, expansion will add 40,000 gross square feet to the main facility. It will include 15,000 square feet of Class A galleries, a light-filled atrium, an entry for school and group tours, linkages to existing galleries, and a beautiful new garden. It also enlivens downtown Salem and helps reveal the exceptional beauty of East India Marine Hall, the museum’s original building, now a National Historic Landmark. How do you add onto a historic landmark? The museum holds an extremely diverse collection of Chinese, Japanese, Korean, Indian, Native American, Oceanic, African, American Decorative Art, American Art, Photography, Maritime, Asian Export and Fashion and Design collections reflecting a legacy of New England's shared heritage of creative expression worldwide. The new expansion provides the highest quality storage, care, preservation, and research access to these large and extremely important collections that have never been possible to display until now. Fine, but that doesn't make the contrasting styles any less jarring. 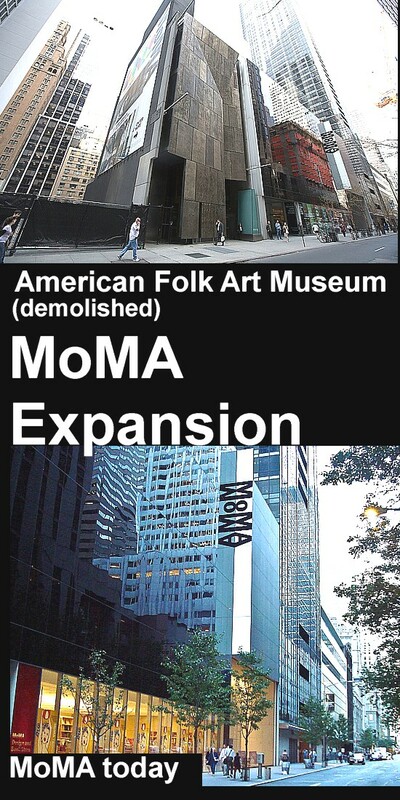 The MoMA expansion on paper, where they remained for two long years. On the other side of the coin, in the case of the Museum of Modern Art (MoMA) in New York City, adding onto a contemporary glass, steel, and concrete art edifice presents no problem no problem as to contrasting styles. Instead there was the problem of the high price and limited availability of Manhattan real estate. Adding the new to the old is one thing, but tearing down the old to make way for the new is quite another. For decades, right next door to MoMA was the venerable American Folk Art Museum (owned by MoMA). The uproar when MoMA announced plans to raze the museum to allow space for its new addition held up the project for two full years. Some of architects Diller, Scofidio, and Renfro's the more controversial elements in the initial plan for the museum—including the "Art Bay," a glassy entrance facing the street, and the public sculpture garden entrance on 54th Street—have been cut from the design. The total price for the project was adjusted to around $400 million. MoMA's 53rd Street entrance, now and then. The new building on 53rd Street features, with its more than 107,000 square feet, features an expanded ground floor of galleries and public and garden spaces that are free to all. Local and international visitors will find a global perspective in the art and artists on display. With 30% more gallery space, the museum can now present the true breadth of their collection, highlighting the most resonant and innovative art, from early masterpieces to cutting-edge works. Across three expanded floors of displays, a visitor can discover modern and contemporary art’s many stories, shifting histories, and approaches from around the world. A state-of-the art studio and performance center is at the heart of these galleries. It will support a broad range of experimental programming with new commissions, live performance, dance, music, sound works, the spoken word, and artist residencies. This unique space will situate live and time-based artworks as an integral part of the collection galleries, emphasizing the central role of this work within the history of modern and contemporary art. Though distinctive, and somewhat radical in appearance Adjaye's design proves museum architecture can make a statement without drowning out the art work within. Perhaps the best case scenario when it comes to museum expansion is to simply start anew. 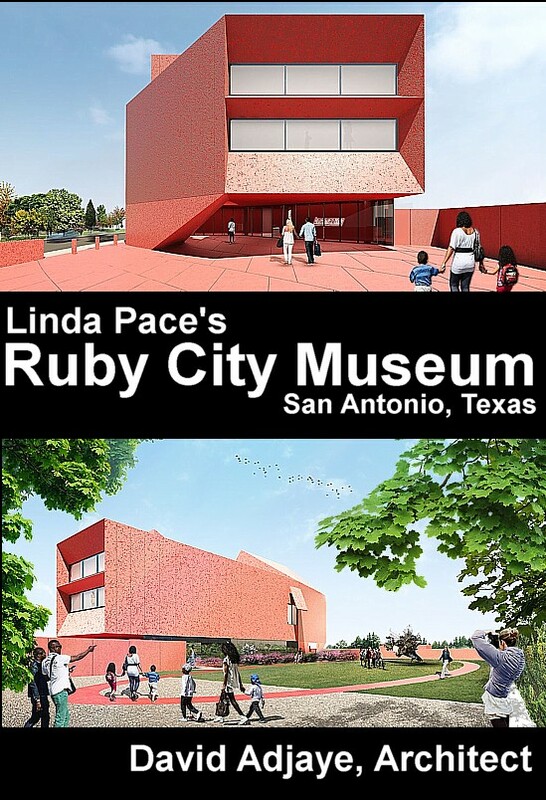 That's what Linda Pace's Artpace Foundation did with it's new facility dubbed "Ruby City" (Linda's favorite color). The name also pretty well describes the new museum, designed by the British architect, Sir David Adjaye (born in Tanzania). It may seem small at just 14,000 square feet, but what it lacks in size, it more than makes up for in character, with its dramatic lines and subtly shifting planes of red rippling over the building’s exterior and into the adjacent plaza. 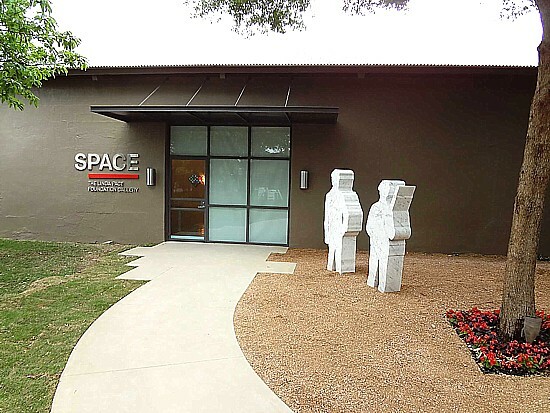 It provides a beautiful home for the foundation’s robust, 800-work-strong collection of contemporary art, but also helps cement San Antonio’s place on the art world’s map. Linda Pace was driven by the belief that art is a vital social force. As an artist, she revealed the symbolic potency of everyday images and objects in her drawings and assemblages. As a collector, she gathered hun-dreds of contemporary artworks into a personal, ex-pressive collection which is now managed by the Linda Pace Foundation, founded in 2003. The Foundation con-tinues to acquire work which reflects Linda’s sensibilities from a feminist perspective, engages social issues, while considering aspects of spirituality and beauty. And as a philanthropist Pace boldly fostered the work of those who are considered to be today’s most adventurous artists with her founding of Artpace in 1993, an international artist in residency program. In addition to her work in Texas, Pace served on several committees and supported the work of contemporary artists both nationally and internationally. The new and expanded Academy of Motion Pictures Museum in Los Angeles. On a much larger scale, it would seem another art institution has likewise started from "scratch" to build a new museum to house its burgeoning collection. 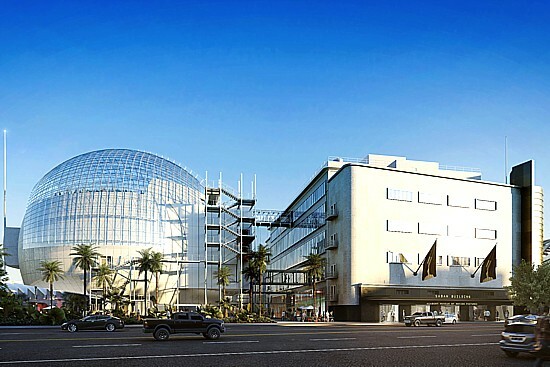 In fact, the new Academy Museum of Motion Pictures is also an addition (to the old May Department Store building on the corner of Los Angeles' famed Wilshire Blvd. and Fairfax). In this case, the new addition, at 300,000 square feet, is actually larger than the original structure, which makes it seem like a totally new museum. To encourage visitors to explore, dive deeper, and directly interact with exhibitions, collections, filmmakers, and fellow film lovers, the Museum’s public programs includes panel discussions, symposia, gallery talks, and other public events. The 288-seat Ted Mann Theater will offer daily thematic and exhibition-related screenings. Special showings and events will be held at the 1,000-seat David Geffen Theater (the heart of the big ball shape). In addition, the Museum now offers an innovative range of digital engagement platforms and interactives, including a groundbreaking new app. Okay, so it looks like a leftover prop from Close Encounter of the Third Kind, but the giant sphere is designed that way to house the new 1,000 seat movie theater. ﻿For nearly a century now, the Academy of Motion Pictures Arts and Sciences (AMPAS) has primarily been known by most Americans as the people who pass out the Oscars each year. Since 1929, the Academy Awards have been the ultimate recognition of moviemaking excellence. Originally a dinner for industry insiders only, the ceremony has gradually become a global phenomenon watched by millions around the world. Visitors to the expanded museum can now trace the rich history of the Academy Awards and the story of the Oscar in an exhibition that includes favorite highlights, memorable winners’ speeches, private backstage moments, and rarely seen materials from the Academy’s collection. The exhibition looks back at the show, its glamour as well as its controversies, and the ways in which the Academy Awards ceremony has evolved to become a mirror of our culture. Way too much for an afternoon at the movies. Designed by Renzo Piano Building Workshop, with contributions by Studio Pali Fekete, the museum relieves the somewhat shocking realization that Los Angeles did not have a major museum devoted to the art form it revolutionized. 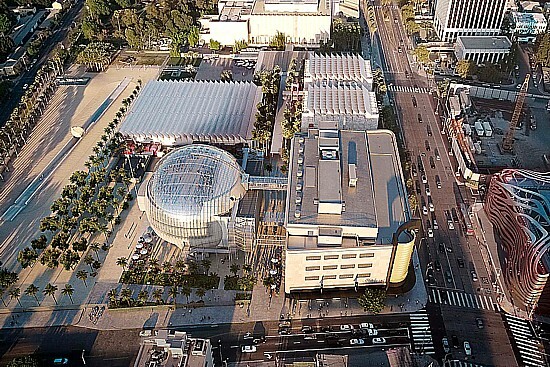 The group that gives out the Oscars is making up for that with an otherworldly Renzo Piano–designed complex right next to the Los Angeles County Museum of Art. The Academy Museum of Motion Pictures addition is designed to complement the historic Saban Building's Streamline Moderne style. It got a full restoration—and a dramatic, spherical building sprouting out back. The complex will house two cinemas, as well as 50,000 square feet of exhibition space that will show off items including Dorothy’s ruby red slippers from The Wizard of Oz (1939), the typewriter used to write the screenplay for Alfred Hitchcock’s Psycho (1960), and an 1887 collotype plate of a galloping horse by motion picture pioneer, Eadweard Muybridge. An aerial view of the huge Academy of Motion Pictures Museum complex. And finally, the New Orleans Museum of Art (NOMA) seems to have the right idea. Rather than build on, they simply moved a sizable number of their sculptural pieces (those which can withstand the tropical elements) into an outdoor museum that is restful, rather than tiring or overwhelming. 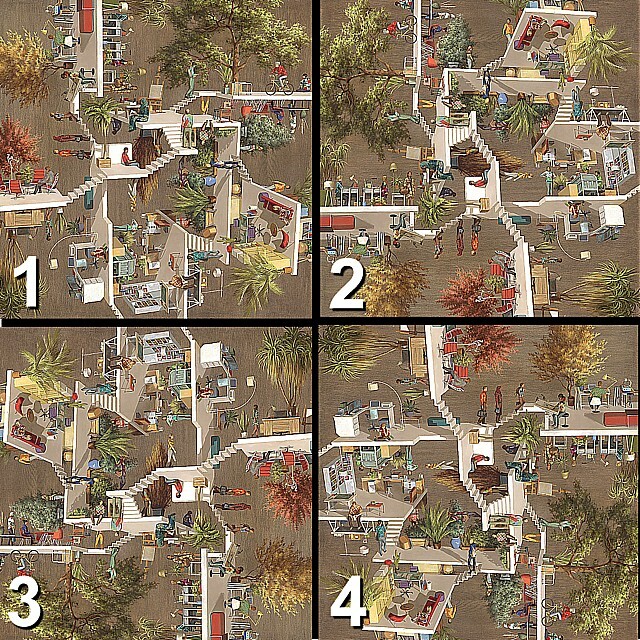 The result is the new Sydney and Walda Besthoff Sculpture Garden (top). The sculpture garden occupies approximately five acres in City Park adjacent to the museum. Atypical of most sculpture gardens, this garden is located within a mature existing landscape of pines, magnolias and live oaks. The garden design creates outdoor viewing spaces within this picturesque landscape. A reconfigured lagoon bisects the site and creates two distinct halves (below): a mature pine and magnolia grove adjacent to the museum, and a more open area of 200-year-old, Spanish moss-laden live oaks across the lagoon near the New Orleans Botanical Gardens. The Sculpture Garden has grown from its inception in 2003 to include 64 sculptures, most of them donated to NOMA by the Sydney and Walda Besthoff Foundation. Rendering of the expanded Sydney and Walda Besthoff Sculpture Garden at the New Orleans Museum of Art. The New Orleans Museum of Art’s picturesque sculpture garden, connects the museum to the historic City Park surrounding it, becoming one of the institution’s star attractions. The park now displays the work of an almost embarrassingly long list of artists such as Coosje van Bruggen, Claes Oldenburg, Henry Moore, Fernando Botero, Antoine Bourdelle, Gaston Lachaise, William Zorach, Jacques Lipchitz, Isamu Noguchi, René Magritte, Barbara Hepworth, Seymour Lipton, Arnaldo Pomodoro, Kenneth Snelson, George Rickey, Elisabeth Frink, Masayuki Nagare, Lynn Chadwick, Louis Bourgeois, Jesus Bautista Moroles, George Segal, Deborah Butterfield, Alison Saar and Joel Shapiro. and others amid lagoons, canals, and oak and cypress trees laden with Spanish moss. The park has more than doubled in size. In addition to many more sculptures, the new stretch of park will boast an outdoor amphitheater and a small gallery building. Set amid five glorious acres are priceless sculptures, all of which make up the magnificent Sydney and Walda Besthoff Sculpture Garden. The Sculpture Garden is the latest cultural destination for visitors to New Orleans and provides a unique opportunity for visitors who treasure the arts. One of my "pet peeves" as an art instructor for many years were perfectionists. These were often fine artists of whom I joked, "gave perfection a bad name." I've always suspected such people simply feared starting a new project to the point they seemed to hang on to the previous one eternally. I have nothing against an attempt to achieve the highest standards in ones work...up to a point. Then there develops the scientific principle of diminishing returns. Or, as I put it, some things are too major to fix and not major enough to worry about. History fails to record whether Girolamo Bedoli held the same opinion as I regarding this artistic trait but he certainly encountered it during his time as the painting master for a young man named Girolamo Francesco Maria Mazzola. Today we know him better by his nickname, Parmigianino (the little one from Parma). 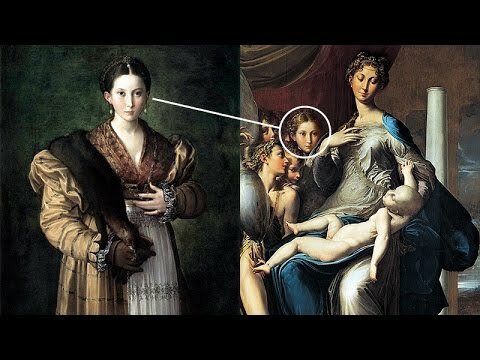 Parmigianino (left) was a perfectionist who often tinkered with his works to a fault. He ended his life in debt and disgraced by the church after failing to adequately complete a fresco-commission in his native Parma. But he is remembered primarily for the curious grace and elegance of his elongated figures, represented best in the Madonna of the Long Neck (top) painted between 1534 and 1540. That's six years and it was still incomplete! 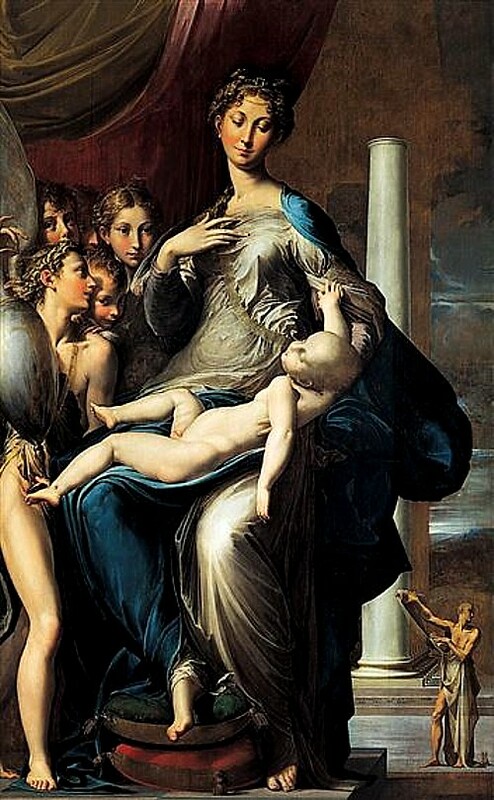 Parmigianino's obsessive working of the fine composi-tional details of the figures meant that he left other parts--the sky, the columns, the partially faded figure of Saint Jerome in the bottom-right background--incomplete. 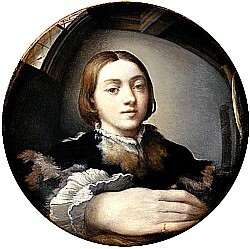 Incidentally, the face peering over the shoulder of the virgin is identical to a portrait he painted in 1524 of Antea Fox (below), said to be his girlfriend. The strange mystic quality of the painting is arguably heightened by the unfinished details. 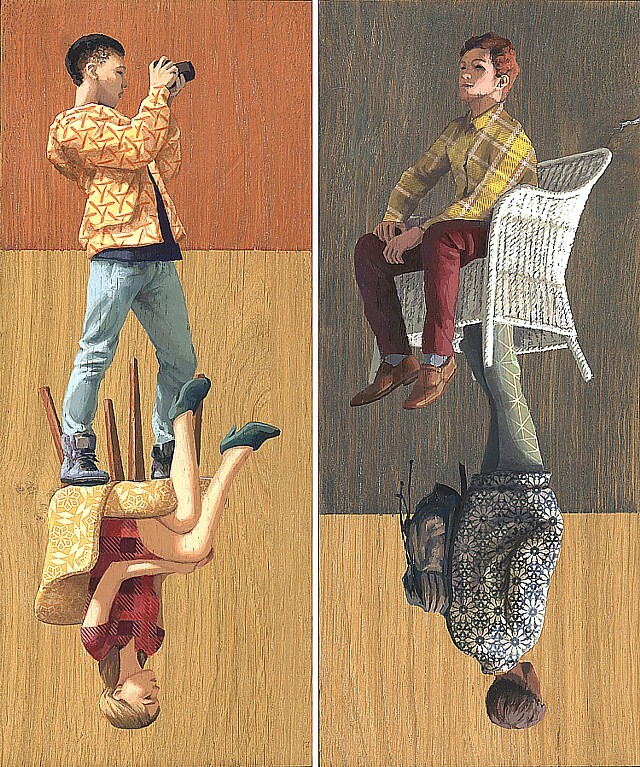 The self-portrait at left was created using a convex mirror. of the girl peering over the Madonna's shoulder. Perfectionism is by no means the only reason major works of art go unfinished. Sometimes events intervene giving the artist good reason for leaving a painting unfinished. 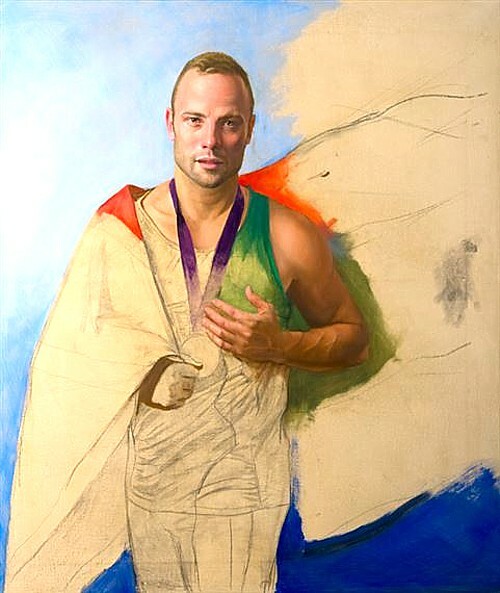 In 2012 Contemporary painter Natalie Holland began a portrait of the athlete, Oscar Pistorius (below). The commission was in celebration of Pistorius, a double-amputee who ran with the aid of specially-designed "blades," becoming the first with his condition to compete at the non-disabled Olympic Games. While Holland was still painting, Pistorius was found guilty of culpable homicide following the death of his partner, Reeva Steenkamp, from gunshot wounds. Deeply disturbed by the event, Holland left the painting incomplete, making it a haunting monument to the faded glory of Pistorius and the tragic loss of Steenkamp. The famous painter, Jacques-Louis David encountered a similar confluence of events causing him to leave unfinished what might have been his greatest masterpiece. David, the most prominent French painter of his day, became a follower of Robespierre and supporter of the French Revolution towards the end of the 18th century. The unfinished canvas of the 1789 Oath of the Tennis Court (below), depicts a crucial moment of solidarity and purpose for the revolutionaries. It includes certain heads and figures partially-completed in oil paint. The exposed musculature of their sketched bodies seems to break through a surface to reveal detailed, impassioned faces. 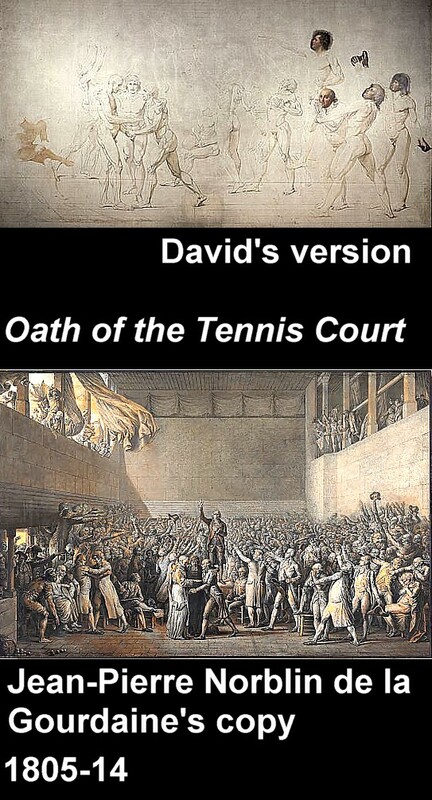 The first engravings showing The Tennis Court Oath only appeared in 1790, the year David convinced the Jacobin Club to launch a national subscription to fund a painting to depict the event. He exhibited a pen and brown ink drawing of his planned painting in the Louvre in 1791 but did not have enough money to follow it through as the subscription had only had a 10% return. The National Constituent Assembly thus decided to fund the work from the public treasury instead, topped off by selling engravings of the painting. Numerous political events intervened causing the artist to eventually leave the work is disgust. It’s possible the unfinished work is even more evocative of the National Assembly’s struggles than a completed painting would have been. Upper image: David's unfinished canvas when the money ran out. 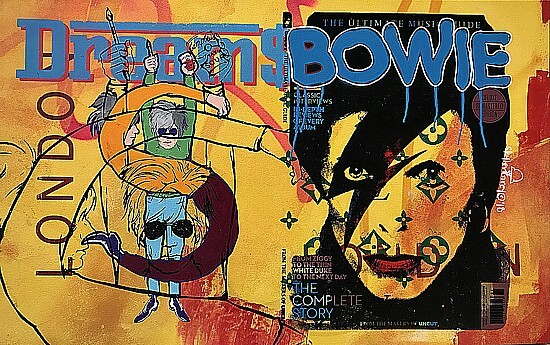 Lower Image: A copy based upon David's false start. Perhaps the best excuse an artist might have for leaving a work unfinished is death. 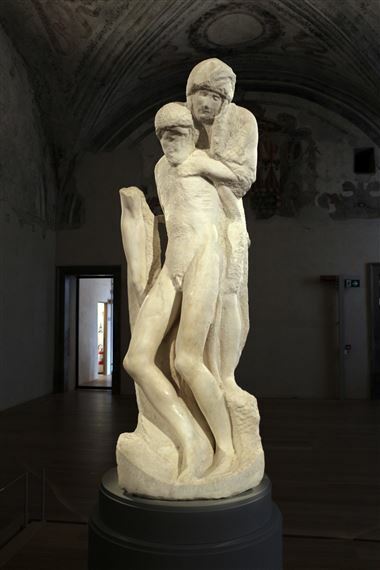 Michelangelo’s final sculpture the Ron-danini Pieta (left) he began in 1552. He died in 1564, frail, and in ill health at the age of 89. The marble sculpture depicts the moment when Jesus’ body was cut down from the cross, falling into the arms of his mother. The artist began carving a muscular, idealized Christ, much in the high-Renaissance style. At some point during the process, however, he had a change of heart. The curved arm of the old figure remains, but the sculptor has dug deeper into the marble to begin forming a broken, emasculated corpse. It’s possible Michelangelo realized as he progressed that changing his mind as to his vision of the scene was not such a good idea and simply abandoned the work. However the unfinished results may well be the most human and touching depiction of Christ ever done by Michelangelo, even as it re-mains unfinished. Stuart was born a few hundred miles north of Philadelphia in 1755, in what was then the colony of Rhode Island. 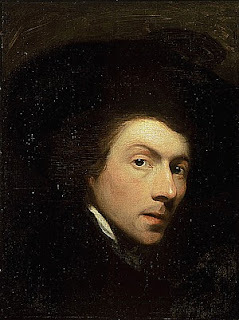 The son of a Scottish settler who made snuff in the family basement, a young Gilbert Stuart honed his precocious artistic talents under the guidance of the Scottish painter Cosmo Alexander. In 1775, amid the clamor of the American Revolution, Gilbert relocated (fled?) to Europe to forge a career as a portraitist. He found little success until the highly sought-after American-born painter, Benjamin West, took the younger artist under his wing. Under West’s tutelage, surrounded by the work of the foremost British portraitists, Stuart began to blossom. After leaving London for Dublin in 1787, “Stuart came promptly to dominate the portrait market,” In a letter a friend and fellow artist, Stuart wrote of his upcoming return to his native land: “There I expect to make a fortune by Washington alone. I calculate upon making a plurality of his portraits…I will repay my English and Irish creditors." 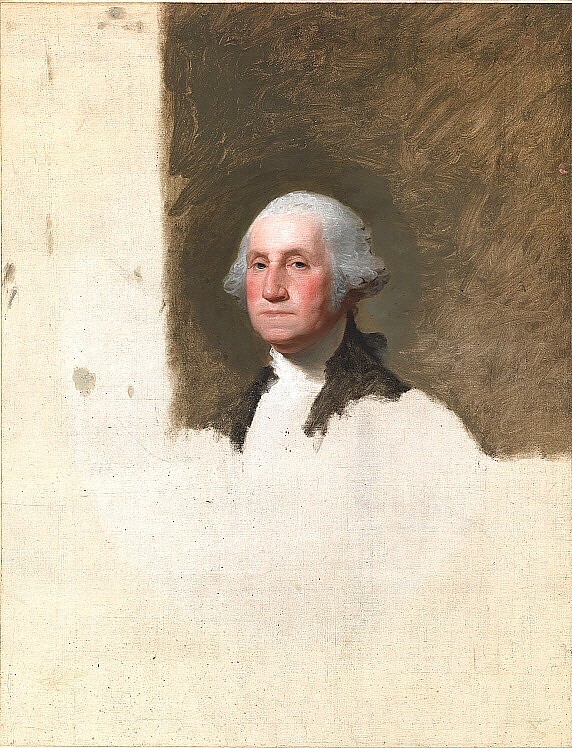 Leaving his portrait of Washington unfinished made a great excuse for not delivering it to Martha Washington as promised. Stuart made his return in 1793. After working for a year in New York, Stuart finally travelled the 80 miles to Philadelphia, then the capital of the United States. Armed with a letter of introduction from a new patron, the Chief Justice John Jay, Stuart left his calling card at Washington’s house in 1794. A year later, the President sat for Stuart for the first time. 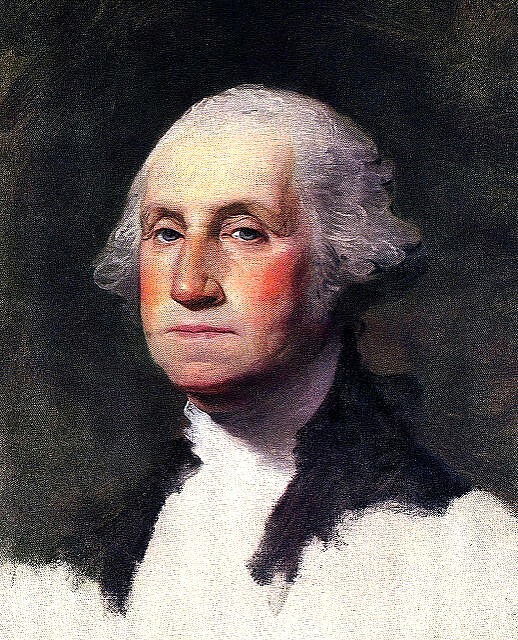 By all accounts Washington was sullen and cross, annoyed at having to sit for so long. Stuart, who was known for his temper as much as his charm, and who often refused to finish a work if he found the sitter dull or unattractive, brought his best behavior to these sessions. His first painting, known today as the Vaughan Portrait, shows Washington from the waist up: Stuart painted him proud and tall and lit from behind, as if haloed. obtain a more pleasing composition. That painting was so successful that, according to artist Rembrandt Peale, Martha Washington “wished a Portrait for herself.” She persuaded her husband to sit again for Stuart “on the express con-dition that when finished it should be hers.” Stuart, however, did not want to part with the picture and left it unfinished so that he could refer to it when producing future commissions. Known as the “Athenaeum” portrait because it went to the Boston Athenaeum after Stuart’s death, this is the painting which served as the basis for the engraving of Washington that appears on the one-dollar bill. Stuart painted some 130 copies of his long delayed portrait of Washington which he sold for $100 each. Martha never did receive her promised painting. Sagrada Familia, Antoni Gaudi, begun in 1915, still under construction today. It might seem hard to believe, but at least one artist began his most famous work never intending it to be finished. 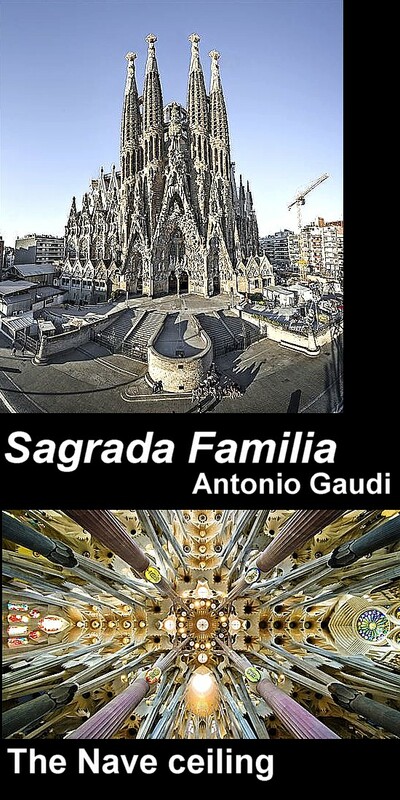 Antoni Gaudi was not a painter but a Spanish architect born in 1852. He died in 1926 at the age of 73 leaving behind a large Roman Catholic Church in Barcelona. Sagrada Familia (above, meaning holy family) represents the peak artistic achievement of the Catalan architect and designer. Such was the ambition of GaudÍ’s visionary modernism that his designs are yet to be completed more than 90 years after his death and more than a century after his church was begun. Eighteen spires are planned (of which eight have been completed) representing the 12 apostles, the Virgin Mary, the four evangelists, and Jesus Christ himself. The facades and interiors are replete with carvings and sculpture reflecting the natural world, telling bible stories, and decorating the whole building with intricate, neo-gothic modern art. It's as if Gaudi, fully aware of all the other unfinished works strewn through the history of art, sought to outdo them all. The best estimate as to completion of Gaudi's masterpiece is around 2026...or 2028, sometime thereabouts.